This post discusses the PIP benefits that are available on all Kentucky automobile insurance policies for people who live in Kentucky at the time they take out insurance. If you have an Ohio motor vehicle policy or lived in Ohio when you got car insurance, you can check this page of our blog to find out more about Ohio’s no-fault benefit, Med Pay. Kentucky passed the Motor Vehicle Reparations Act (MVRA) in 1974. Among other things, the MVRA requires all Kentucky drivers to have liability auto insurance, and requires all such auto insurance to have no-fault benefits, which is often called Personal Injury Protection (PIP). PIP benefits must be at least $10,000.00 per person covered by the policy, and can go to pay any medical treatment related to an automobile accident or lost wages related to the automobile accident up to $200 per week. If you look at the itemization of your auto insurance premium, you will see that part of your premium goes to support your PIP benefits. Kentucky’s main purpose for passing the MVRA law was to make sure Kentuckians injured in car wrecks got prompt medical treatment and rehabilitation by ensuring that money was set aside to pay for whatever treatment was necessary. Although $10,000 does not stretch nearly as far today as it did in 1974 – especially where skyrocketing medical bills are concerned – PIP payments are still a crucial first link in a long chain of medical payments for most car accident victims in Kentucky. How Does Your Medical Treatment Get Denied By The PIP Carrier? Northern Kentucky residents have started seeing more and more denials of PIP benefits in recent years. Where car accidents are concerned, Lawrence & Associates mostly represents victims in Boone, Kenton, Campbell, Grant, and Gallatin counties, and in those counties we have mostly observed Allstate and Geico challenging treating doctors by refusing to pay PIP. Typically, Allstate or Geico will challenge the treating doctor by sending medical records off to a “peer review” or a “utilization review.” These are both bogus terms for “hiring a doctor who has never treated you to second guess your doctor.” The insurance company will send you a formal letter that typically does not address you by name, advising you that your treatment cannot be approved until the “peer reviewer” has given a decision. To make matters worse, your health insurance company will often refuse to cover the bills because, by law, the PIP insurance company is “primary” which means the PIP carrier has the duty to pay before the health carrier does. For this reason, your medical treatment stops entirely, even if you are in pain or getting worse. Your PIP carrier then sends a “review,” which is the peer reviewers report. It will either accept the treatment as being necessary and related to the car accident, deny the treatment, or recommend an “independent medical exam” (IME). An IME means you have to allow the insurance company to pick a doctor for you and go see that doctor. The trick of an IME is that IME doctors are not truly independent; they are paid by the insurance company and nearly always claim that future treatment is unnecessary. (If they cost the insurance company money, why would the insurance company continue hiring them?) Regardless of whether the treatment is accepted, denied, or referred to an IME, it is rare for the PIP carrier to put the review letter in language that a layperson will understand. The end result? You pay premiums for PIP coverage and never see the PIP money that you paid for. In the meantime, your untreated injury keeps hurting and keeps getting worse. How Can An Attorney Help Make Your Auto Insurance PIP Benefits Pay For Your Medical Treatment? The worst thing about the process above is that the MVRA doesn’t allow it. The MVRA states that a PIP carrier like Geico or Allstate must file a claim in court if it wants to deny PIP payments for your medical treatment. These insurance companies can’t ship all your medical records off to some hidden doctor in a backroom, with no transparency as to why medical treatment is being denied! Rather, the law requires the insurance companies to challenge a treating doctor (and you!) in open court, with full transparency. Auto insurance PIP carriers only get away with this because the average person in Northern Kentucky doesn’t know the rights that come with their auto insurance premiums. If a PIP carrier wrongfully denies you the payment of your PIP benefits, you are allowed to sue that company in court and get 18% interest on all overdue payments. Further, if the PIP carrier didn’t have a “reasonable foundation” for denying your PIP benefits, you can force the insurance company to pay for your attorney’s fees. However, forcing the PIP carrier to relinquish your insurance benefits to you will necessarily involve filing the case in court and proving the insurance carrier is wrong. The insurance carrier will hire attorneys to represent it. That means you’ll need an attorney to represent you too. At Lawrence & Associates, we are Working Hard for the Working Class. 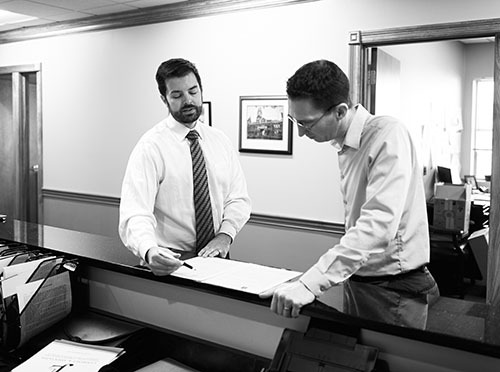 We take great pride in representing Northern Kentucky residents who have been injured in car accidents. We can’t fix broken bones or heal cuts, but we can make sure no one takes advantage of you while you are hurt. PIP carriers that ignore the law to line their pockets with your money should be brought to justice. We can help. Call us today.